“The compassion that doctor-assisted suicide offers is hollow. And this legislation has dangerous implications for our state, especially for the poor and vulnerable,” Archbishop Gomez said. 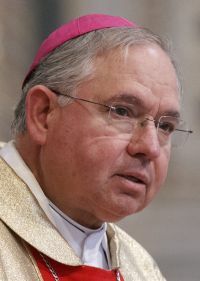 Archbishop Gomez made his comments in an essay, “Dying with dignity in California,” posted June 9 on the website of the Tidings, Los Angeles’ archdiocesan newspaper. The state Senate had approved the bill June 4 by a 23-14 vote. The bill was sent to the state Assembly for consideration. A planned June 23 hearing in the Assembly on the bill was postponed the night before; no new date was immediately offered. He added, “The debate over doctor-assisted suicide is a distraction that is preventing us from confronting the real issues that we face in public health,” citing Americans’ longer lives and the growing incidence of such age-related illnesses like Alzheimer’s and Parkinson’s. Under the bill passed by the Senate, doctors will be allowed to prescribe life-ending drugs to those with a terminal illness expected to live less than six months longer. The bill has a conscience clause permitting individual doctors to refuse a patient’s request to prescribe the drugs. It is believed this clause is what caused the California Medical Association to drop its objections to the bill. Patients must be assessed by two independent physicians, provide two written and one verbal request for the lethal drugs, and wait 15 days before a doctor writes a prescription. Disability rights advocates campaigned against the bill, but lawmakers might have been more swayed by the parents and husband of Brittany Maynard, a California woman who, upon learning she had a terminal illness, moved to Oregon last year so she could take advantage of that state’s physician-assisted suicide law. California Gov. Jerry Brown has not taken a position on the bill, but his aides said Brown had talked to Maynard before she died. One California woman facing a terminal illness is using her remaining days to defeat the bill. Stephanie Packer, 32, a wife and mother of four, was told in 2012 she had three years to live. She is affected with scleroderma, which is a hardening of the skin and connective tissues. All the scarring caused by the disease has paralyzed her gastrointestinal tract, requiring her now to take all of her nutrients through a tube. A bill was last introduced in the California Legislature on physician-assisted suicide in 2007, but the bill never came to a vote.